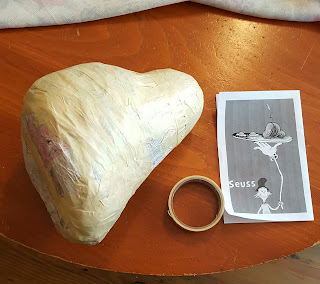 I learned to read from Dr. Seuss books; the easy-to-read childrens' series by Dr. Theodore Seuss Geisel, so they hold a special place in my heart. "Hop on Pop", "Go Dogs Go", "Bartholomew and the Ooblek" just to name a few. 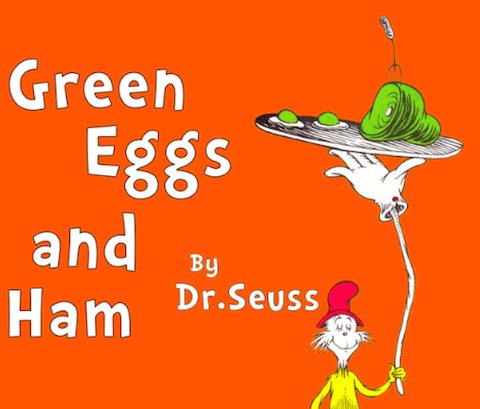 And of course, "Green Eggs and Ham", which taught me to try new things, situations and people. 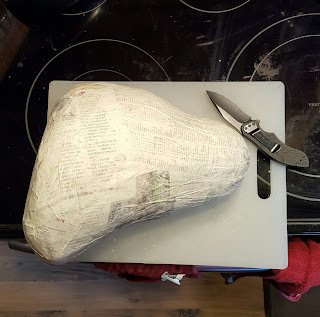 I started with the ham. I wanted a good-sized ham so I stuffed plastic bags with paper and wrapped them with masking tape to achieve the rough shape. Once I had the shape I wanted, it was time for the paper mache. Using a simple flour-water paste I covered it in layers of newspaper, as usual. Put it back in the oven, it's not done! Here it is with a seal coat of masonry paint. 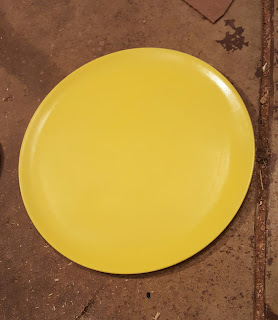 It won't need the weather sealing, but the color helps me to spot imperfections. Would you, could you in a sewer? Could you, would you on a skewer? Don't forget the hambone! I cut the shape of the bone out of styrofoam and glued it on. 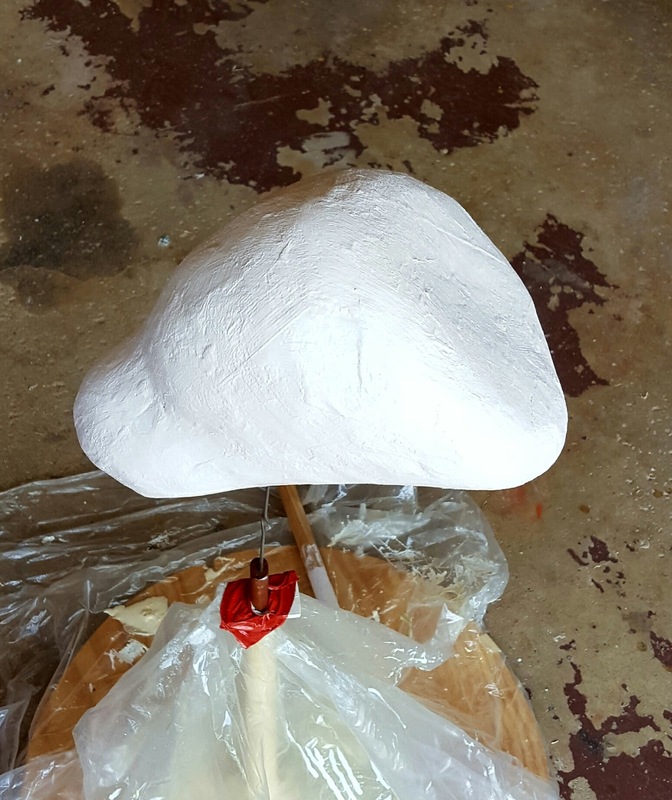 Don't worry; this will all be covered with brushed-on plastic resin (Styrospray 1000) which will harden to a durable, smooth finish. 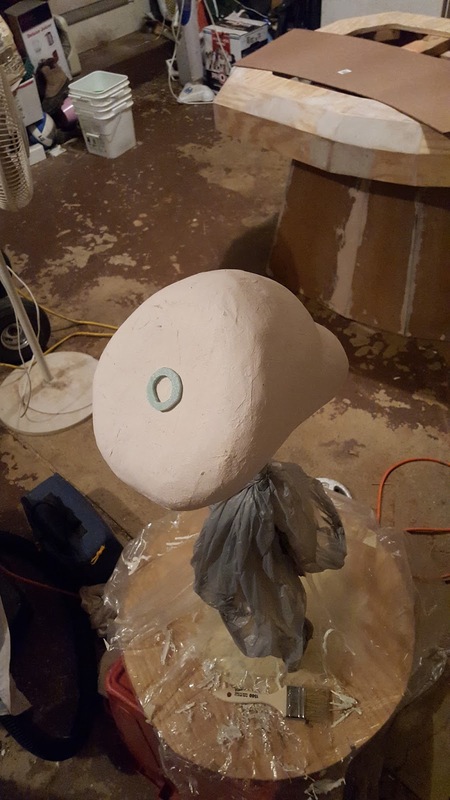 (I can't believe I didn't take any pictures of the process!) It's much like painting with a thick paint (while using a respirator). I used disposable brushes because it's very difficult to save the brushes after use. Here's what the finished ham looks like. 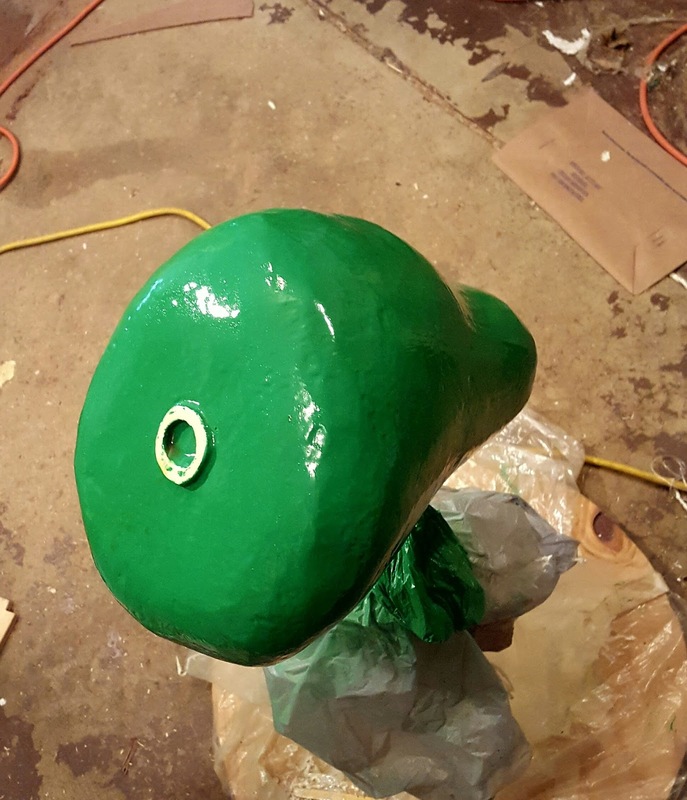 It's been coated with plastic, sanded, spray painted and sealed with polyurethane. That's a lot of work condensed into one sentence; again, sorry no pictures. Mmmm ... you know what would go great with that? "But what about the eggs?" you ask. "Strospray 1000" would serve for the whites, but I needed some yolks. I went back to my stryrofoam, carved out two egg yolks and smoothed them carefully with fine sandpaper. 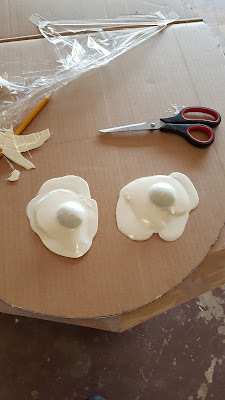 The next step was easy: set the yolks on a sheet of plastic film and carefully pour a batch of plastic resin over them. After a little trimming the results are smooth, semi-flexible shapes resembling fried eggs. 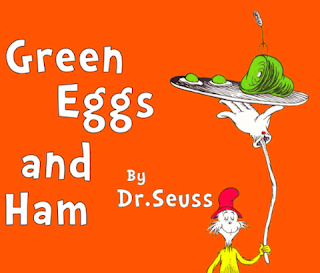 The yolks will be painted an appetizing green. Now for a trip to the thrift store to find a platter and a fork to complete the setting. I found a circular platter that looked great once I spray painted over the design with a sunny yellow. I couldn't find a suitable three-tined fork so I bought a grilling fork that should look just fine with a little work. 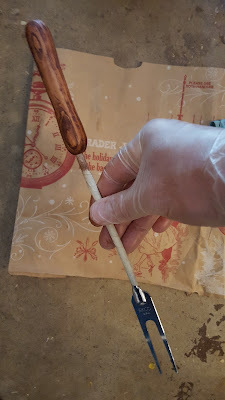 I wanted the handle to resemble the illustration so I sawed off the handle and made my own. 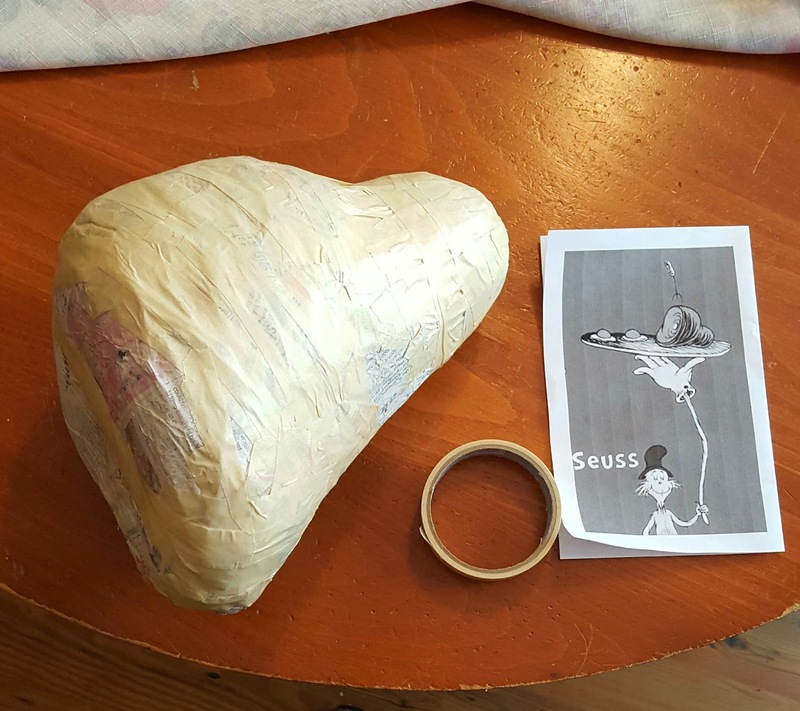 A length of dowel was drilled, carved and sanded into a peanut-like shape. Here it is after staining. "You don't need a silver fork to eat good food." Soon I'll put it all together, then dinner will be served.